Netflix didn’t add as many subscribers as expected by a bunch of people on Wall Street who, on a quarterly basis, govern whether or not it’ll be more valuable than Comcast — and that is probably a bad thing, as it’s one of the primary indicators of its future potential for said finance folk. 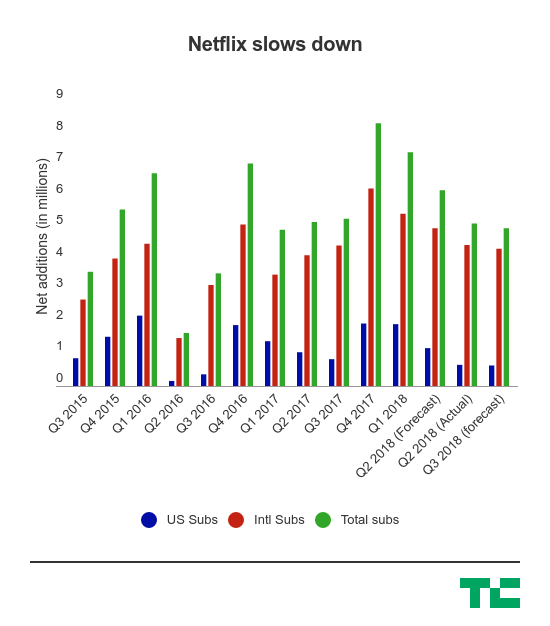 While it’s still adding subscribers (a lot of them), it fell below the forecasts it set for itself during the second quarter. That’s shaved off more than $10 billion in its market capitalization this afternoon. This comes amid a spending spree by the company, which is looking to create a ton of original content in order to attract a wider audience and lock them into that Netflix ecosystem. That could include shows like GLOW, Jessica Jones, 3% or even feature films. But it’s still a tricky situation because it needs to be able to convert shows from that kind of crazy spend schedule into actual subscribers. Of course, all of this is certainly not great for the company. The obvious case is that Netflix has to attract a good amount of talent, and that means offering generous compensation packages — which can include a lot of stock as part of it. 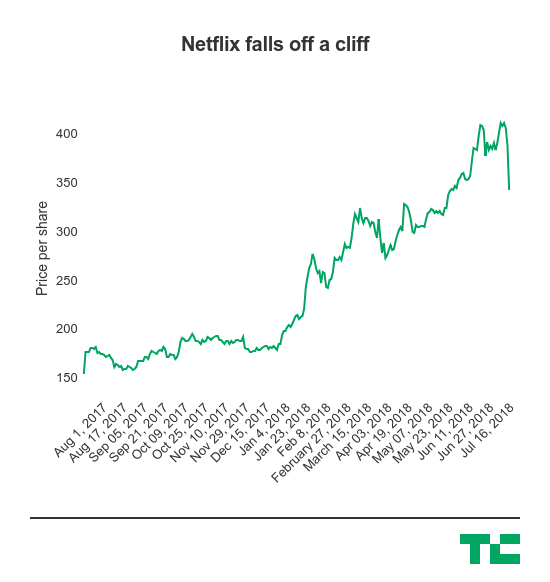 But Netflix is also a company that looks to raise a lot of debt to fund the aforementioned spending spree in order to pick up additional subscribers. That’s going to require some assurance that it’ll be a pretty valuable company in the future (and still around, of course), so it may make those negotiations a little more difficult. Everything else was pretty much in-line, but in the end, it’s that subscriber number that didn’t go as well as planned.